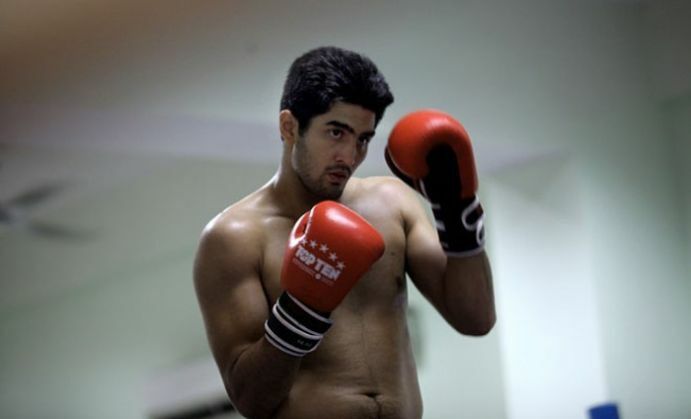 Unstoppable so far, star Indian boxer Vijender Singh will now gun for his maiden title in the professional circuit when he fights for the WBO Asia belt come June in front of home fans in the national capital. The middleweight boxer, who earned worldwide fame by becoming India's first Olympic and World Championships medallist at the amateur level, has exhibited rampaging form even in the pro arena. Since his debut in the circuit last October, the 30-year-old from Haryana has won all his three pro contests via knockouts. His next bout is scheduled for March 12 in Liverpool, the opponent for which is yet to be named. "I am already excited. My first title fight, that too in front of my own people, in my own country. It cannot get better than this. I have no idea who my opponent is going to be but I am sure I will carry on the way I have so far," Vijender said from Manchester where he is currently training for the March 12 showpiece. The venue for the Asia title bout could be the Indira Gandhi Indoor Stadium, which will be examined by WBO officials on February 22. "It's the next level for him. He will fight for the WBO Asia title in June and a team of WBO officials will recce for venues in Delhi. The first venue to be checked out will be the Indira Gandhi Indoor Stadium," Vijender's India promoters, IOS Boxing Promotions' MD Neerav Tomar said. The WBO delegation, which will touch down in India on Saturday, comprises the body's first vice-President John Duggan, Chairman Officials Michael Pernick, and referee Mark Nelson. They will be joined by Vijender's UK promoters Queensberry Promotions' chief Francis Warren . Also there would be Benjamin Murphy, the Broadcasting Head of Boxnation - the official broadcasters of Vijender's bouts in the UK. "For the time being, Vijender will continue to train and fight in the UK. After his March 12 bout, which will be of six rounds, Vijender will fight two more bouts in April and possibly beginning of May. These two bouts will be eight-round affairs," Tomar said. "This will be followed by the Asia title bout in June which will be either 10 or 12 rounds in all," he explained. As for Vijender's opponent, Tomar said it could either be a Chinese or a Korean. "There will be a series of meetings to decide on who would be his opponent. Most probably, it would either be a Chinese or a Korean," he said. During their time here, the WBO officials will also explore avenues for promoting professional boxing in India at the grass root level. "The WBO officials will conduct a seminar for the Indian Boxing Council (IBC) on Sunday. There will be discussions on how to take pro boxing to the grassroot levels," Tomar said.